How do plants decide where to place a new organ? This recent preprint on lateral root development provides new insights into a mechanical checkpoint and characterizes expa1-1 as a new player for the organization of asymmetric cell divisions. How do plants decide where to place a new organ? This recent preprint on lateral root development provides new insights into a mechanical checkpoint and characterizes expa1-1 as new player for the organization of asymmetric cell divisions. One of the strategies plants use to increase the complexity of their root system is the continuous post-embryonic initiation of new lateral roots. Modulation of root architecture in general, and lateral root formation in particular, has profound impact on plant development, stress resistance and yield. Asymmetric cell divisions are crucial in various contexts during plant development and rigid cell walls prevents cells from moving. The local organization of division and differentiation is therefore indispensable for plant development. However, underlying mechanisms of asymmetric divisions remain scarce to date. Polarization cues from animals are not conserved and it is only recently that the plant field has started to assemble various pieces of the puzzle. Mechanical information provides important cues for cell polarity in uni- and multicellular systems. Underlying mechanisms in plant development, however, are not completely understood yet. Ramakrishna et al. compared transcriptomics data of genes induced by lateral root initiation with key regulators of asymmetric cell divisions and cell wall remodeling enzymes. They chose EXPANSIN A1 as a putative candidate. Pericycle cells locally bulge before asymmetric cell divisions which could be a result of local cell wall remodeling. EXPANSIN A1 shows a distinctive expression pattern in pericycle cells following nuclear migration before lateral roots emerge and it remains expressed in the small daughter cells after the formative division. The expa1-1 mutant displays auxin-dependent differences in the biochemical properties of pericycle cell walls which affects local bulging required for proper positioning of the cell division plane. Strikingly, the expa1-1 mutant loses the organized cell pattern during early stages of lateral root initiation seen in wild-type plants. The authors suggest a new biophysical lateral root organogenesis checkpoint that depends on pericycle cell width. EXPANSIN A1 appears to locally induce cell wall remodeling in pericycle cells. This suggest a polarity cue that either directly or indirectly regulates EXPANSIN A1 action in only parts of the cell. Asymmetric cell divisions still occur in expa1-1 mutants, however they are oddly positioned, which hints at factors for the establishment of cortical division plane determination downstream of EXPANSIN A1. The Arabidopsis genome encodes for many expansins. Given the relatively mild phenotype of expa1-1, how redundant are the homologues and do those also play a role during formative divisions. And if so, where? How does auxin regulate the local action of EXPANSIN A1 in pericycle cells? Is EXPANSIN A1 also expressed in other parts of the plant? How many days after germination was the expression of EXPANSIN A1 quantified and how many lateral roots are present at that time? Does it play a similar role during other formative divisions or in completely different contexts? 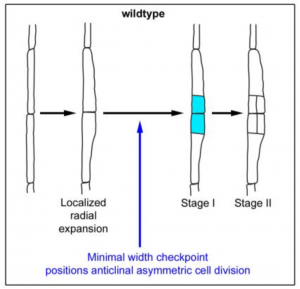 Figure: A minimum width is required for ordered asymmetric divisions of founder cells during lateral root initiation. If the whole pericycle bulges, as in the expa1-1 mutant, asymmetric cell divisions do not occur in a coordinated way. Figure taken from Fig. 4E of the original preprint. EXPANSIN loss-of-function phenotypes are scarce, so we were extremely enthusiastic when our detailed microscopic analyses revealed a developmental defect in the expa1-1 mutant. This work will be the starting point to explore local auxin action, polarity cues and division plane positioning in the pericycle. Regarding some of the questions you raised, I have the following reply. Is EXPANSIN A1 also expressed in other parts of the plant? Interestingly, EXPA1 is also expressed in Arabidopsis guard cells and seems to control stomatal opening (Zhang et al 2001 Plant Cell Rep 30:27-36). Does it play a similar role during other formative divisions or in completely different contexts? More detailed studies will reveal if EXPA1 is expressed during and plays a role in, for example, (early) stomata development. How many days after germination was the expression of EXPANSIN A1 quantified? EXPA1expression was analyzed in seedling roots 5 days after germination. 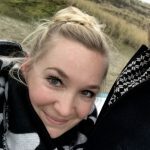 Federica G. Centonze, Veronika Reiterer, Karsten Nalbach, et al. Alain Garcia De Las Bayonas, Jean-Marc Philippe, Annemarie C. Lellouch, et al. Jacob P. Keller, Jonathan S. Marvin, Haluk Lacin, et al. Janet Chenevert, Marianne Roca, Lydia Besnardeau, et al. Shih-Jui Hsu, Emily C. Stow, James R. Simmons, et al. Adam K. Glaser, Nicholas P. Reder, Ye Chen, et al. Aviel Even, Giovanni Morelli, Chiara Scaramuzzino, et al. C. Favard, J. Chojnacki, P. Merida, et al. Marion Regnier, Arnaud Polizzi, Sarra Smati, et al. King Faisal Yambire, Lorena Fernandez-Mosquera, Robert Steinfeld, et al. Lauren Saunders, Abhishek Mishra, Andrew J Aman, et al. Masashi Yukawa, Masaki Okazaki, Yasuhiro Teratani, et al. Nicholas P Boyer, Laura E McCormick, Fabio L Urbina, et al. Luis Filipe Ribeiro, Ben Verpoort, Julie Nys, et al. Ana Patricia Ramos, Ola Gustafsson, Nicolas Labert, et al. Christina Paliou, Philine Guckelberger, Robert Schöpflin, et al. Myungin Baek, Vilas Menon, Thomas Jessell, et al. Omaya Dudin, Andrej Ondracka, Xavier Grau-Bové, et al. Michael J Prigge, Nikita Kadakia, Kathleen Greenham, et al. Jean Francois Darrigrand, Mariana Valente, Pauline Martinez, et al. Adrian Janiszewski, Irene Talon, Juan Song, et al. Hyun Min Jung, Ciara Hu, Alexandra M Fister, et al. Kelvin Lau, Roman Podolec, Richard Chappuis, et al. Philipp Denninger, Anna Reichelt, Vanessa Aphaia Fiona Schmidt, et al. Pauline E Jullien, Stefan Grob, Antonin Marchais, et al. Saiko Yoshida, Alja van der Schuren, Maritza van Dop, et al. The cell wall regulates dynamics and size of plasma-membrane nanodomains in Arabidopsis. Joseph Franics McKenna, Daniel Rolfe, Stephen E D Webb, et al. Kevin R Lehner, Isaiah Taylor, Erin N McCaskey, et al. Abigail R Simmons, Kelli A Davies, Wanpeng Wang, et al. Vitor Amorim-Silva, Alvaro Garcia-Moreno, Araceli G Castillo, et al. Kristina Zahonova, Zoltan Fussy, Erik Bircak, et al. Sandra Cortijo, Zeynep Aydin, Sebastian Ahnert, et al. Usman Anwer, Amanda Davis, Seth Jon Davis, et al. Elena Feraru, Mugurel I. I Feraru, Elke Barbez, et al. Priya Ramakrishna, Graham A. Rance, Lam D. Vu, et al.